Before taking a well deserved Winter Break the MIMS students combined their passions for strategy and travel with a trip to Lufthansa headquarters in Frankfurt, Germany. Several weeks before, the program was split into four groups and each was given their own unique challenge to tackle relating to corporate responsibility. 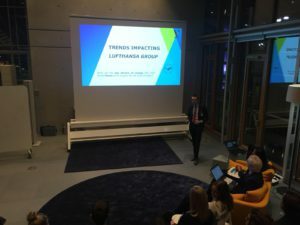 As a company, Lufthansa has vowed to take Corporate responsibility as one of their main pillars of focus and the tasks given reflected that greatly. 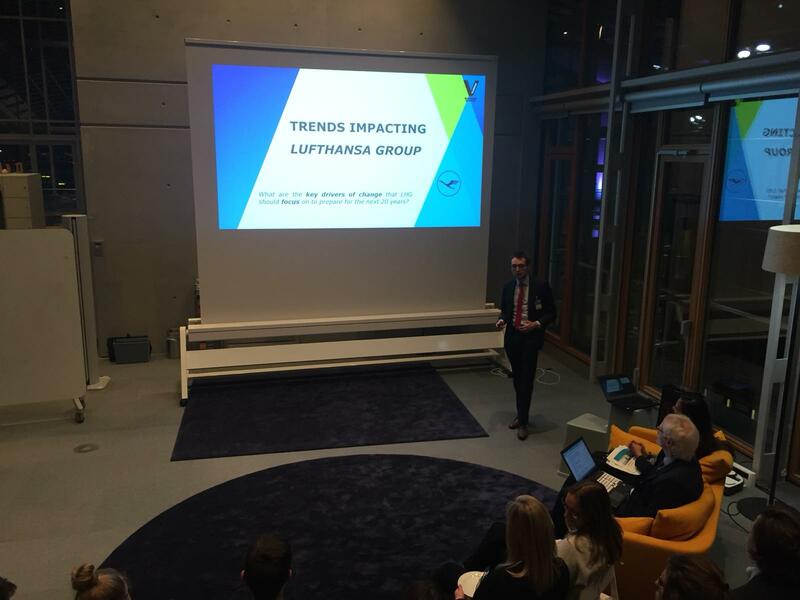 Ranging from challenges focused on the industry as a whole to Lufthansa’s specific role within the world of sustainability. 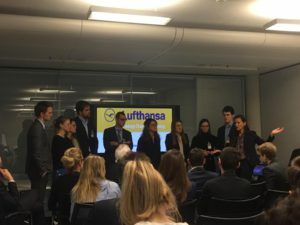 After a great deal of research the groups collaborated their findings, overall recommendations, and creative ideas into dynamic presentations for Lufthansa’s strategy/CR department. Over the course of two days these presentations were given and accompanied by feedback and discussion with Lufthansa’s staff. 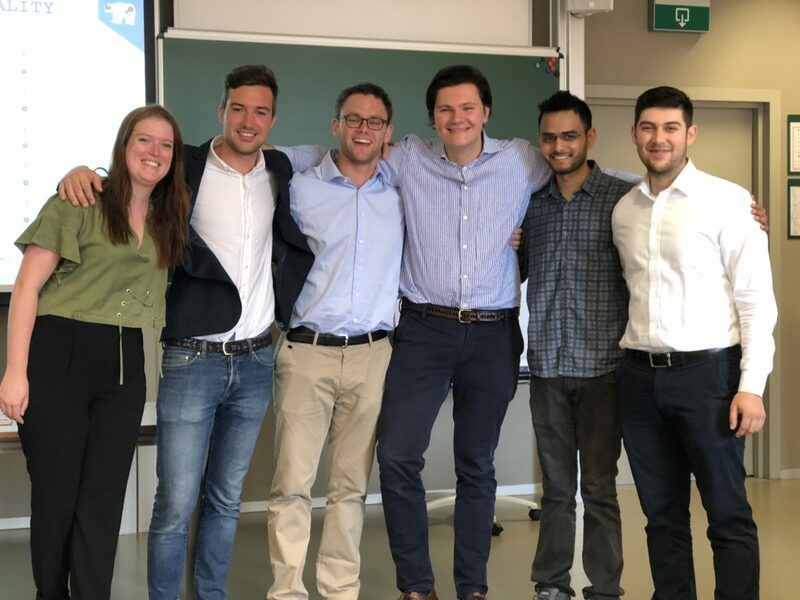 Like many opportunities in the program, Vlerick students were excited to apply their knowledge outside the academic walls of their institution to help a real company. 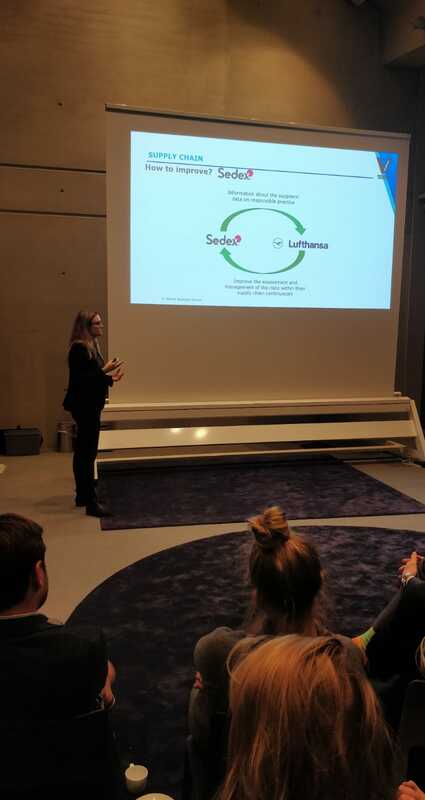 In addition to presenting their work, students also had the opportunity to hear more about Lufthansa as a company with presentations from their strategy department. 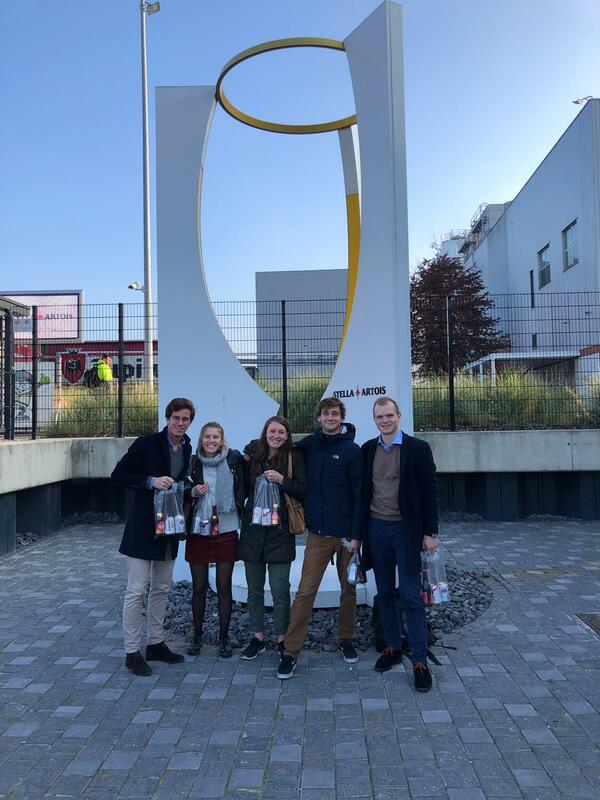 As a special treat, students were even given a tour of the behind the scenes meeting grounds for the pilots that make Lufthansa’s success possible. Here they were guided by a pilot himself who showed the students where pilots meet before flights, brief the crew, and just how much they take into account to ensure a safe and pleasant flight for passengers. Thank you again to Lufthansa for an unforgettable learning experience! On an early Monday (6 a.m. sharp), we traveled from Brussels to AMSTERDAM to visit financial institutions. 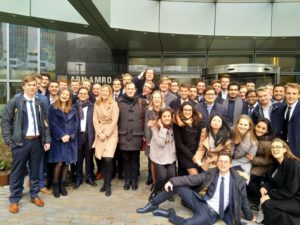 More precisely, we had the privilege to visit ABN AMRO, Kempen and APG. At ABN AMRO we did a business case about M&A in the beer industry. Here is a picture of the winning team, good job guys! APG welcomed us with an interesting presentation that gave us an insight in the world of pension funds. 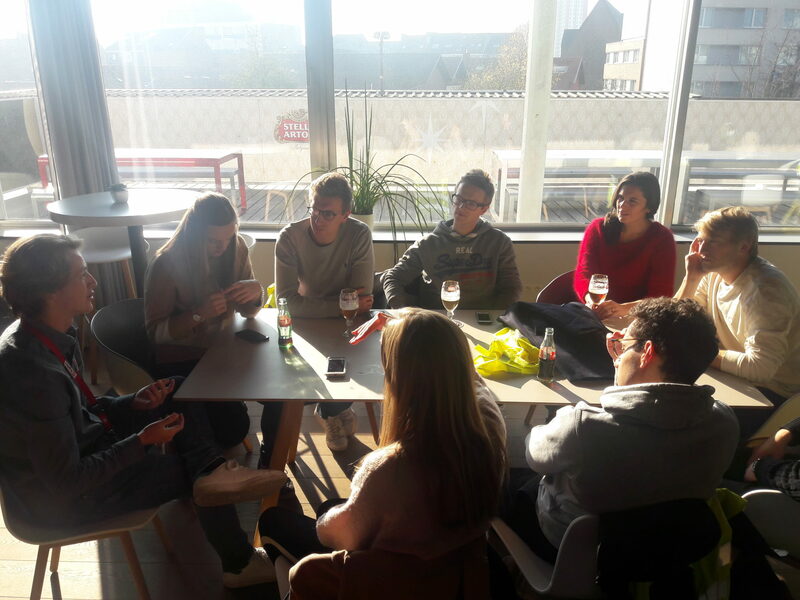 We ended the day by visiting Kempen, where we got a presentation at their very own bar on the rooftop. 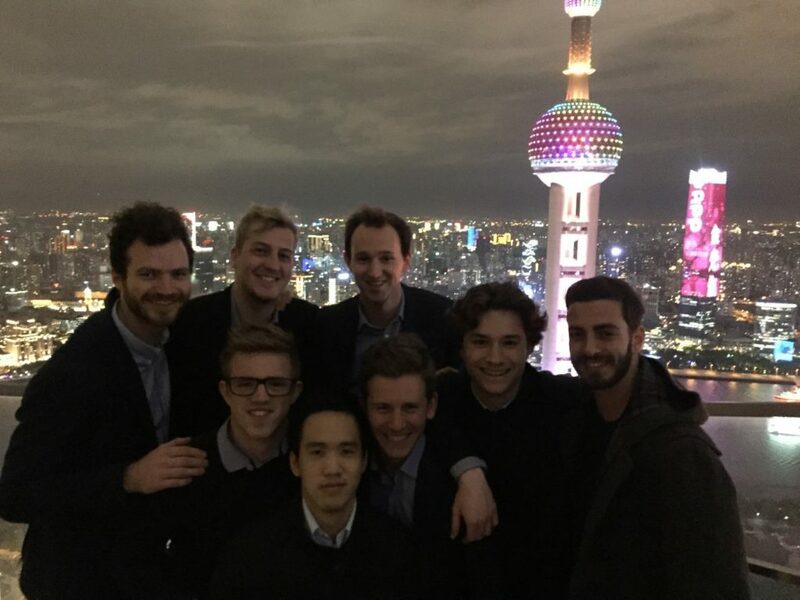 We also had the opportunity to get a sneak peek in the trading room, where we encountered the Chinese wall. On the one side there were the researchers and on the other side the traders. What an exciting experience! 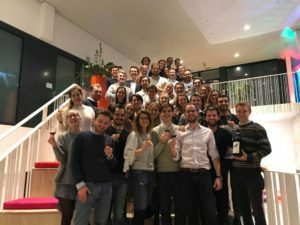 As a finishing touch, we had some Heineken beers and typical Dutch nibbles (like ‘Bitterballen’) together with Kempen employees. 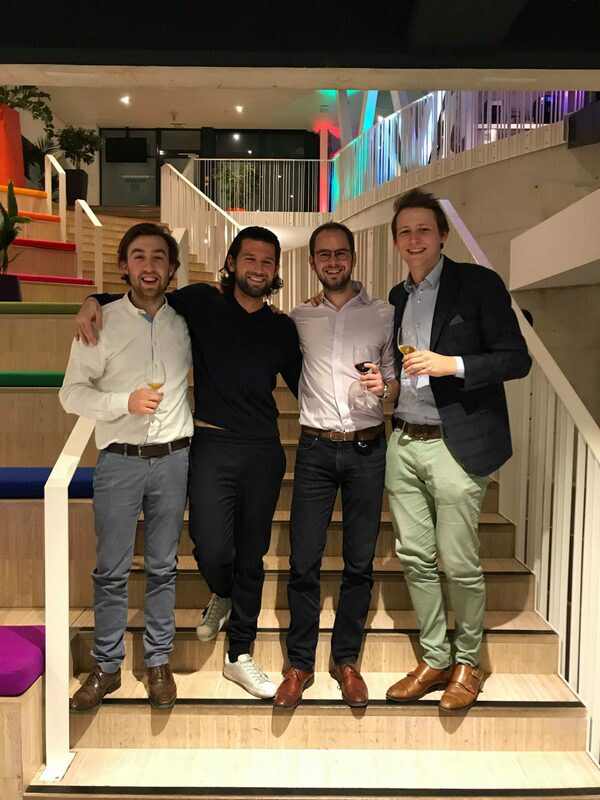 Two of our colleagues of MGM together with one of our own MFM students, Justin Vossaert, founded the very first Vlerick wine club. The first activity was a wine degustation with the head sommelier of ‘The Jane’ Gianluca Di Taranto, who was awarded the best sommelier of the year. It was a great evening that united MGM, MFM and MBA students. Monday the 17th of December was a big moment in our MFM experience as we submitted one of the biggest projects of the year. We had to write an equity research report about Melexis in teams of six people. Blood, sweat, and tears led to great results. The last report was handed in at 5 a.m., just a few hours before the deadline! Last night, the biggest alumni event of the year took place at Brussels Expo near the Atomium. The night started off with inspiring speeches by our Dean Marion De Bruyne, the CEO of Here: Edzard Overbeek, professor Robert Boute and professor Ann Vereecke. Afterwards, we had some drinks and fancy food. What a wonderful evening! 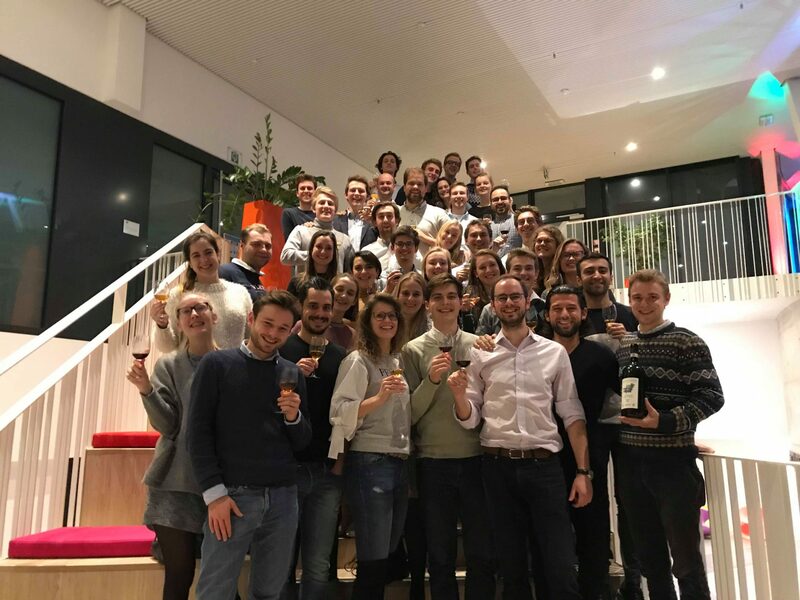 This past week I had the pleasure along with classmates from all three campuses to visit the Ab InBev Brewing facilities in Leuven for our Operations Management class. Despite what some may think, we were not just there for the beer. 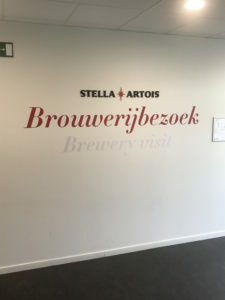 Our assignment was to use concepts from class to evaluate and observe the operational processes Ab InBev uses to produce and package its’ beer. We then used this information to create an in class presentation and had the opportunity to learn about the places our other classmates visited as well. Throughout the 2 hour brewery tour we were able to apply knowledge learned in class in a real life context. The tour included a walk through of the brewing and bottling facilities. While in these areas we were able to see all the work that goes into making the best beers in the world. 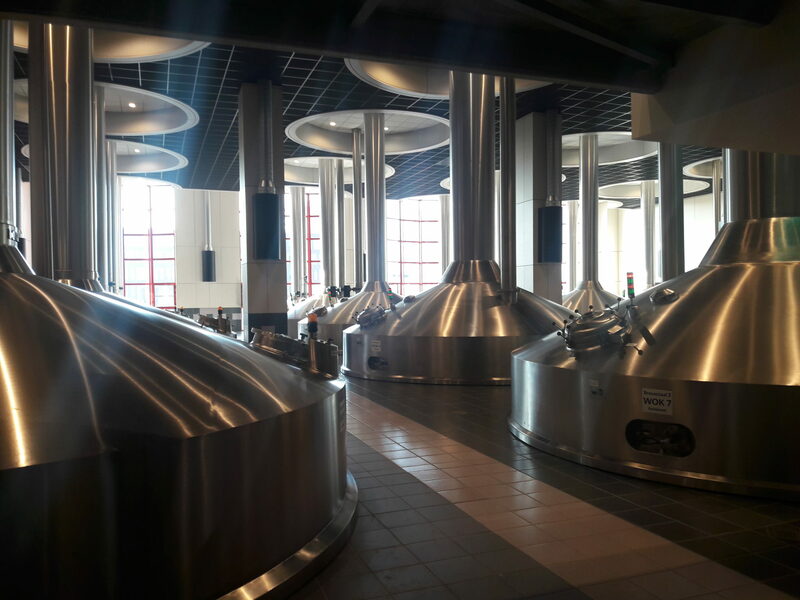 In the brewing facilities, we were privileged enough to get an inside look into the craft behind every step of the brewing process and learn about the quality ingredients used to make their beer so delicious. 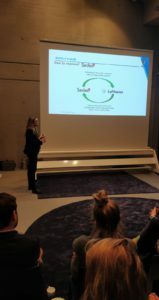 We also learned about the company KPIs (Key performance Indicator) and how they motivate their employees to reach these set performance goals. In the bottling facilities, we learned the precise science behind making sure every bottle filled is just as good as the rest. Personally, seeing how much the company concentrates on both efficiency and sustainability was inspiring from an operational perspective. One of the most impressive things we learned was that 99.9% of materials used are completely recycled and Ab InBev is still continuing to work to find creative ways to eliminate waste. Those that know me know how important I believe sustainability is and it is clear that Ab InBev has that mindset as well! 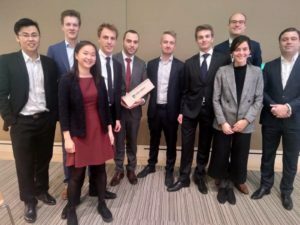 From an efficiency perspective, the operational lead emphasized that Ab InBev is always focused on sustainable solutions that will not only solve present issues but prevent future ones. 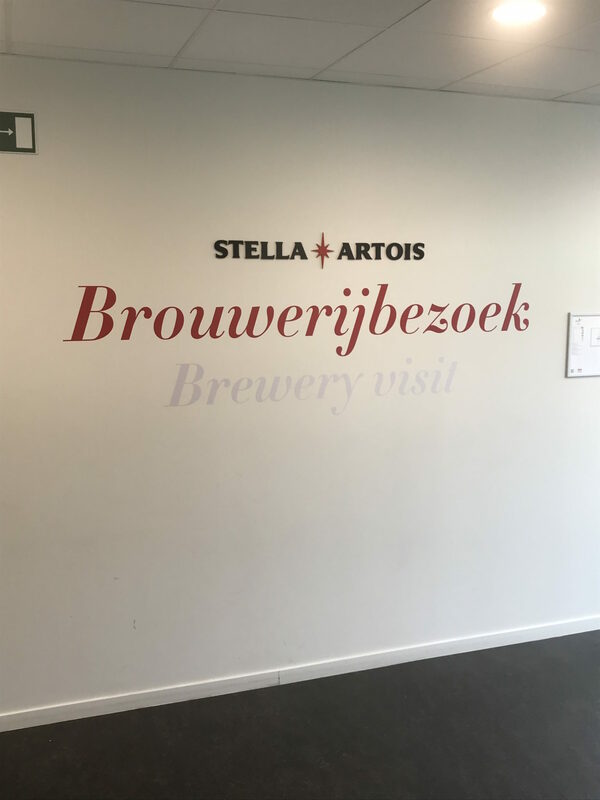 To conclude the tour we were then lucky enough to put our taste buds to the test with a complimentary Stella Artois while learning about career opportunities at Ab InBev. All in all it was a very informative and fun day for my fellow Vlerick Masters students and I. 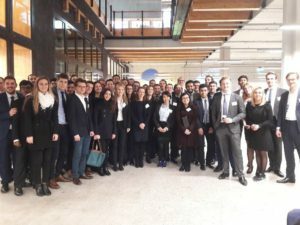 After 4 weeks, the Global Immersion trip of the Vlerick MIMS students came to an end and left an unprecedented and unforgettable impression upon us. More than this, it has been an enriching experience!!! Before our departure to China, we had a couple of free days , thus some of us decided to leave Belgium a bit earlier to do an extra pitstop in Seoul. This allowed us to already get a taste of Asian habits and their culture. I found it an incredible city and we had a lot of fun; we hiked to the Namsam tower, walked through Gangnam District, shopped in Myeng-dong, ate Korean BBQ, and off course, sang Karaoke in the famous KTV bars. 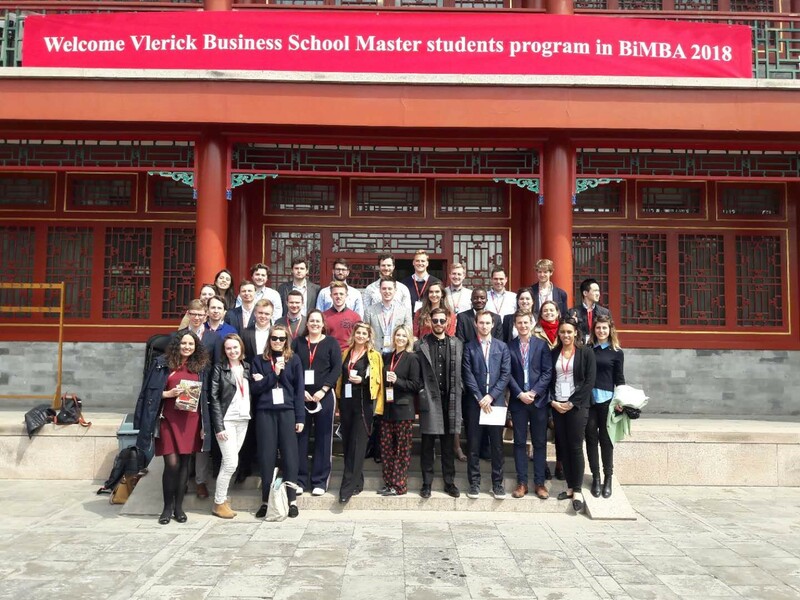 Four days later, the official first week of the Global Immersion module started in Beijing, where the whole MIMS group finally came together. The capital of the People’s Republic of China is known for its ancient and beautiful sites such as the Forbidden City, the massive Tiananmen Square and the great wall. 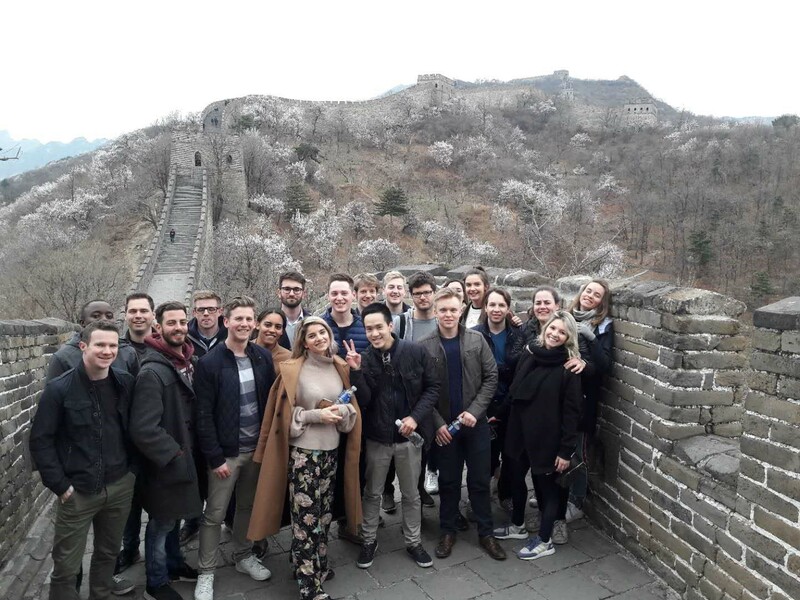 As part of the agenda, cultural visits were combined with interesting company visits at different Chinese companies and lectures at Peking University. They both offered us a better understanding of China’s incredible history, Confucianism, Business Practices in China, the Chinese market and customer behavior. One aspect that totally took us by surprise, was seeing how ‘WeChat’ works in China, the local multi-purpose messaging, social media and mobile payment app. Comparable to Facebook, Instagram, Bancontact App and all other apps you have, but everything combined in ONE super app! Afterwards, we visited Shanghai, where we were totally blown away by the famous and incredible ‘bund’, the riverside from where you can see the majestic skyline of Shanghai. In this location, the program was filled with interesting lectures at Shanghai Jiao Tong University, and visits to AB InBev, CFL and Jas Worldwide amongst others. All those visits contributed to deepening our knowledge about the latest major events and trends in Asia and about cultural differences between the East and the West. A must do experience in China is wandering around the famous fake-markets, where copy-cats of anything you might imagine (or not) can be found; from Gucci handbags to Rolex watches and Rayban sunglasses. Judging from my personal experience, I can already tell, even though you absolutely plan to not buy anything fake, after a couple of hours you will surely end up with some not-needed overpaid gadgets! Next, was the incredible city of Hong-Kong, for me and many of us, the most beautiful and interesting city of Asia, as it is a huge city build on the hills near the South China sea. 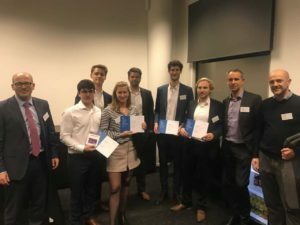 As it is a global financial hub, we got a deeper understanding about cryptocurrencies and trading platforms. Further highlights of the trip where the Victoria Peak and the hike on the Dragon’s back trail, with an unbelievable view on the city and surroundings. The hike ended up with an amazing afternoon at the beach, laying in the sun, playing volleyball and sipping some cold drinks. As Asia is an enormous continent, differences between and within countries are huge, and this couldn’t be more clear after leaving China for Japan, first to Tokyo and afterwards to Kyoto. Tokyo & Kyoto are two cities, incredibly different from each other. While Tokyo is a huge metropole, rumored to have the busiest crossing in the world and an incredible infrastructure, Kyoto is more of a calmer town, filled with rivers, peaceful temples and a lot of nature. One cannot go to Tokyo and miss the hectic morning at the fish market, or tasting delicious sushi freshly made in front of you! Before leaving Japan, karaoke is an experience everyone should try. But wat made the trip the most amazing, was the people: the 32 other MIMS students, our awesome programme manager and our cool programme director!! During IMEx (Integrated Management Exam) a team can rise from the ashes like a Phoenix or crash and burn down to the ground. I’m pleased to let you know that my team rose up like a Phoenix. We had a great time and I learned a lot during this experience! That is why I want to write about IMEx and my highs during this last week before the ICP’s. Also a final congratulations to the winning teams of IMEx 2018!!! During IMEx we represent a high tech toy company that recently had a fire. We had 12 periods to recover from the fire by making decisions related to operation management, people management, marketing and others. These resulted in three different metrics that were shared at the end of each period; profit, people and planet. Our team, named TEKTO (a great creative brainstorm was behind this name btw), did quite well at the start. We scored highest on people and did quite well on our share price, our planet was terrible though but we recovered. Tuesday, after period 5, it was time for our first intermediary meeting with the board of directors. Right before the meeting we discovered we would be first mover of a new product that would be launched. Because of that we were very excited and I must admit a bit too confident. We were sure our company would keep on going up as it did in the past but as you might have sensed by the tone of this text that wasn’t the case. After period 5 we encountered a major set back and our share price dropped by a lot! But when I find myself in times of trouble, mother Mary comes to me, speaking words of wisdom, “let it be“. Just kidding, Karel De Gucht wasn’t there to motivate us and we did not “let it be”. In our time of trouble our team came together and we looked at how we could recover. It was not until period 7 but we did recover! I will now fast forward to period 12 because we created a model that suited our company and caused a growth in the end of 221,98% compared to period 1 which resulted in TEKTO having the highest share price in the end. I will not elaborate too much on our methods because the point of IMEx is that you discover how to do this on your own. I can however share that I learned a lot and I really pushed my boundaries. Near the end of IMEx we got an email about a final guerrilla marketing campaign for which each team would get 30 seconds at the final plenary session. The winner of this campaign would receive eternal fame and 1 additional point for creativity (but I wanted to compete just to challenge myself and I had expectations that this would be considered for the final IMEx winners… the point was that you wanted to move forward with your fictitious company and great marketing of a new product shows that). To end this article I want to thank my team! We had a great collaboration and having a good vibe in your team is really important during IMEx. We were all very pleased with our end result and although we did not win IMEx, in my opinion we are a winning team. It has been one month that we know the results of the sales competition. Therefore, it is the perfect moment to look back to this exciting day! The concept is very easy. Well prepared students take their turn to sell a product to a potential customer. This year the product was Showpad, a sales enablement platform to make content easy to find, share and measure. The competition was divided into two parts. A conversation with the Global marketing director and one with the VP of Sales. In the first talk, the students had to convince the prospect of the value of Showpad and arrange a second meeting. In the second one, closing the deal was the objective. 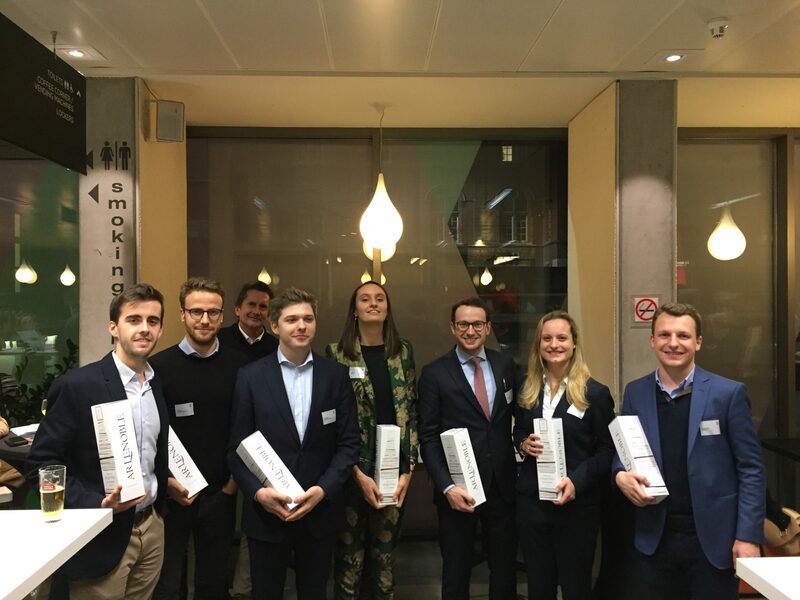 At the end of the day, Alisha Peterle (1st place) and me (2nd, Arnaud Vandenbossche) were chosen out of the seven finalists to represent Vlerick at the European Sales competition in Paris! We are both very excited about this opportunity and will do our best! As you might have noticed, it snowed today! At our Ghent campus we have quite a big garden as well as a pretty large courtyard. 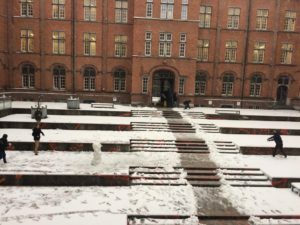 That with the additional factor of having just finished an exam meant there was no other option than to go play in the snow! At Vlerick we have a diverse class with many different nationalities amongst us. 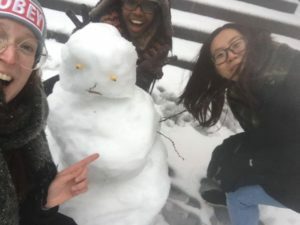 Some of our classmates have never even seen snow before (except for the other time it snowed but we had a career fair that day so no playing in the snow for us Vlerick peeps back then). 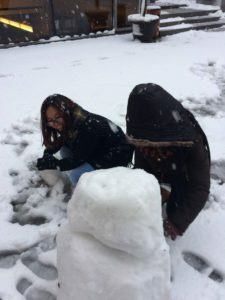 But guess what, today some of us made their very first snowman! At Vlerick you don’t only learn about business relevant things. You also learn some other crucial aspects that are needed in life such as how to build a snowman. Teaching each other things and creating memories together. So, do you want to build a snowman? Hope you had as much fun as us today! 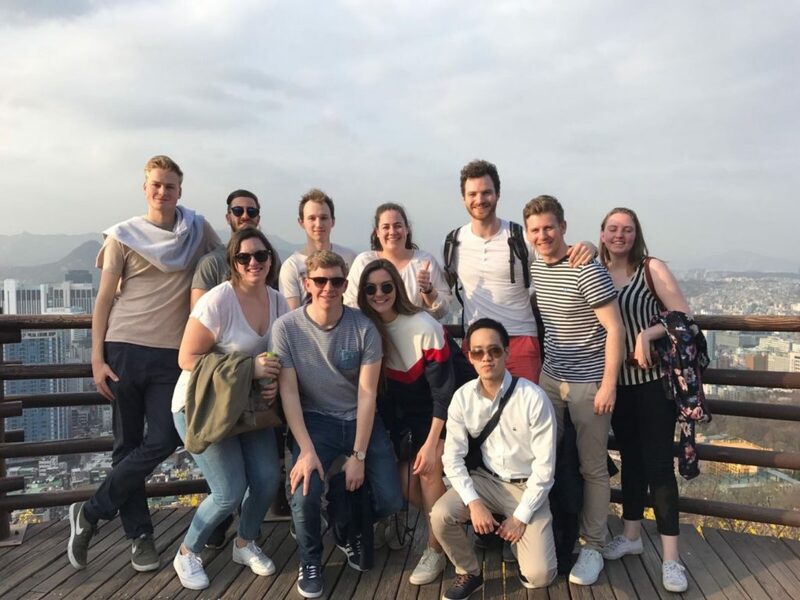 L ast month, our fresh (or at least some of them still are) batch of MFM students went to Amsterdam, the city of canals, bikes, parties and, well… finance! 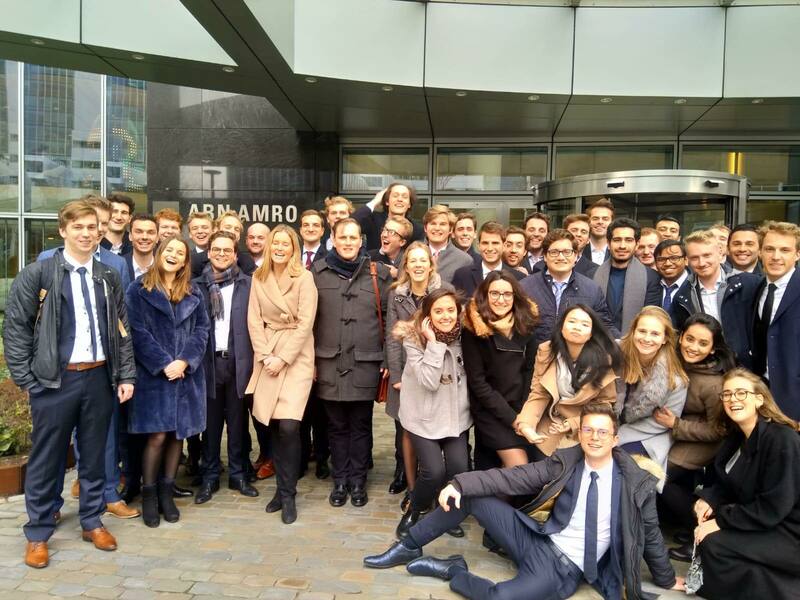 The well-filled agenda of this day consisted of 3 company visits, of which the first one definitely the most appealing to most: ABN Amro. A handful of employees of its corporate finance department gave the students a warm and direct Holland-like welcome and introduced them to the company and its ample career opportunities, after which they were put in teams and did what they do best: case solving! 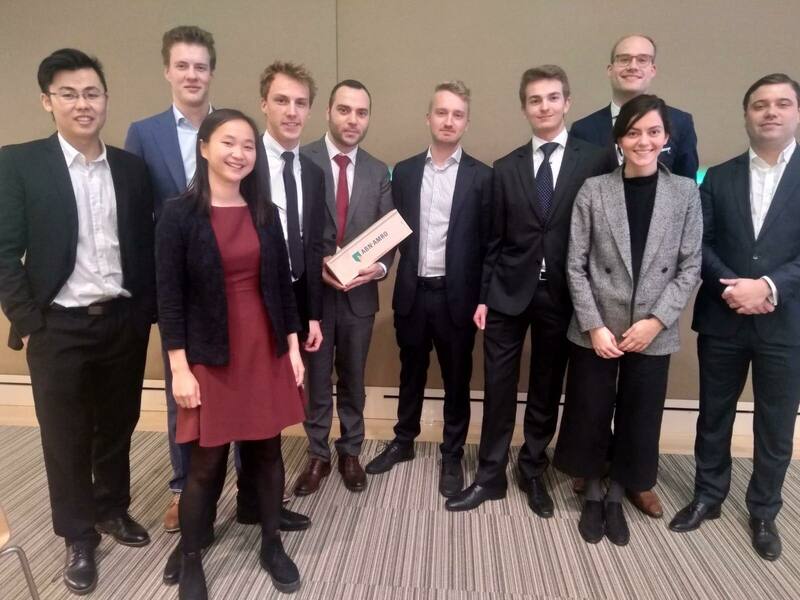 Using spreadsheet models, groups of 5 students prepared for negotiations in a real-life M&A simulation, during which ABN Amro’s associates and trainees gave them helpful insights and guided them through successful negotiations. Eventually, one team won the M&A game. The prize: two bottles of champagne. Cheers! In the afternoon, the group visited Optiver, which is a trading room. Forget Wolf of Wall Street-like scenario’s where men in suits shout and curse over telephones and figuratively throw around $ 100 bills. This trading room is nothing like you’ve ever seen (or thought of as) before. Some 100 mathematicians and engineers, having 24/7 access to a ping pong table, a restaurant with a personal chef, a bar and two PlayStation 4’s, wander around a campus-like office in sport shoes, jogging pants and hoodies. For once, our suited-up students felt awkwardly overdressed. 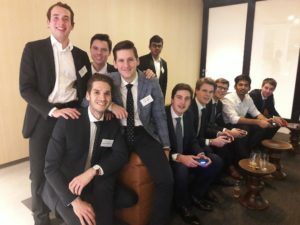 After an exciting trading game, an exclusive and brief visit to the trading room and some testimonials from the traders and researchers themselves, our students were rewarded for their attention with nothing less than pizza and beers. The first thing you notice when you visit the Ghent campus is that the building -which is quite old- has been put in a modern jacket. That being said, some of the original structures are still present today. If you have a slight interest in architecture and/or history this is something that will catch your eye. You might even wonder what happened in these corridors all those years ago. If you have ever visited the campus you will notice that the façade hasn’t changed much over the years. 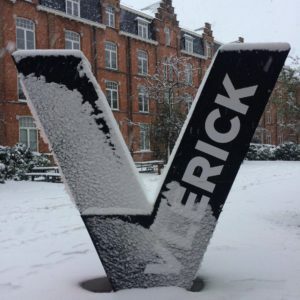 When looking at the photo you can tell that apart from a Vlerick banner and a new door it remained pretty much the same. What went on inside did nevertheless change plenty. 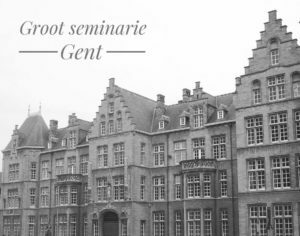 Did you know that the seminary was already active in the sixteenth century? However, it was not till 1905 that they decided to build a new seminar located at ‘de reep‘. Architects A. Lemeire, A.R. Janssens, O. Bernaert and S. Mortier worked on the project together. 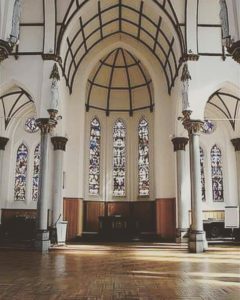 Using gothic revival architecture -also known as neogotiek- was evident to them since it had always been associated with the spiritual and religious life during the Middle Ages. So it made sense to use this style to capture that same feeling. The seminar had room for 200 (religious) individuals and had a total surface of 10.448 m2 which was distributed across three floors. The building was eventually finished in 1914, unfortunately for the seminary this was marked by World War I. The German military occupation named the building the ‘Hohenzollern’ barrack, Ghent residents mockingly decided to name it the ‘hay attic’. In 1918 the Belgian army moved into the building and baptised it as the ‘Albrechtskazerne’. It was not until 1925 that the seminar could live up to its original purpose. 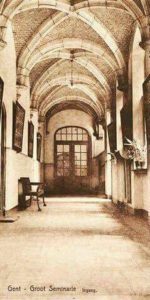 A deal was signed and the priests could finally move into the ‘groot seminarie’ on the first of January in 1926. Fast forward to the 21st century, 2002 marked the end of the seminary. Sending sons to become priests had become old fashioned and over the years the building became too big for its residents. A new purpose for the building was needed and renovations started in June 2002 by architectural firm Buro II. Minimal changes were made to keep the gothic revival architecture intact but Buro II added some modern and current twists. Ultimately creating the building we see today. If you now enter the campus and walk through the corridors you can still see some parts of the ‘grand seminarie’. Among other things there are the typical arches on the first floor. On the second floor you can see some relics from when the building served as the ‘albrechtskazerne’. The chapel still exists but the only praying that is going on there happens when a difficult exam takes place. A little fun fact about the chapel; it turns out that during those good old days a priest would leave an organ somewhere inside the walls of the chapel. (Unfortunately?) This organ has not yet been found. There is however a pipe organ present which can still be used today. Want to see all of this in real life? Then come and visit the Ghent campus on our open days and experience the history together with some classes!